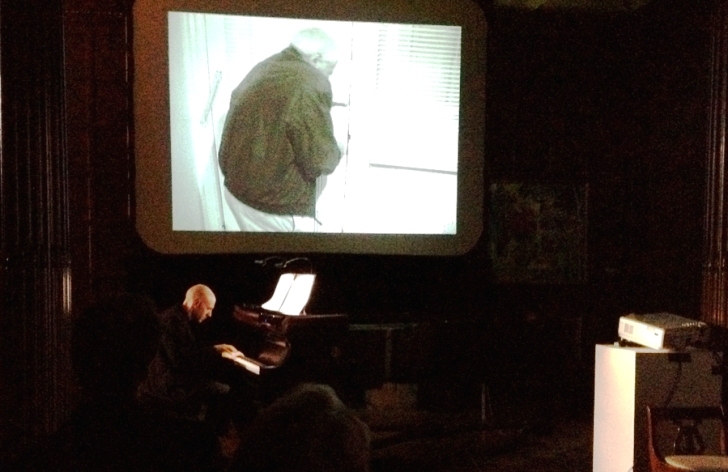 Performance of Michel van der Aa's Transit in the Music Room, combining piano performed by Jacob Greenberg and projected film. Photo by Klaus Ottmann. Often when you speak to people after a performance of so called avant-garde or 20th century music, they look confused and rather lost as to how it is they are supposed to feel. The search or desire for feeling and connection in music lies in its great power to inspire emotional pathos. Listening to a few bars of a Schubert sonata or the triumphant finale of a Beethoven symphony can shake you by the collar, stun you into silence, leave you breathless, or bring you to tears (though hopefully not all four at once). The extent to which music, above other arts, is unique in its ability give life to the ineffable qualities of the human condition, to–in the words of Aldous Huxley, “express the inexpressible”, however, is an unknown quantity. The debate rages on. Modern music to some degree challenges the collective commonality of our associations and feelings about music. Its world orbits dissonance rather than consonance, the atypical as opposed to the typical. Just as dadaism rejects accepted conventions of aesthetics, the same trend emerged in music through philosophies and new formalist techniques of Schoenberg, Berg, Webern, and the neoclassical style of Stravinsky. 20th century music, in all its abundant variance, can feel aurally challenging because the traditional elements that we associate with music–rhythm, melody, harmony–are dissected or subverted and presented in new ways. Within the last 100 years, this quest for new and ever more apposite means of musical expression–in times of huge political, social, and spiritual upheaval–has become the dominant musical ethos. Atonality and dissonance are here to stay in the world of classical music, but how to make sense of this seemingly amorphous sonic realm can feel mystifying, like looking into a Rothko canvas and thinking, what is it that I’m supposed to see? Perhaps the visual connection can help. In the 1970s, painter Rainer Wehinger created a graphic representation of the piece Artikulation by Hungarian composer Gyorgy Ligeti. Wehinger created a language of color and shape, rejecting standard notation to visually replicate the aleatoric blips and drones of Ligeti’s sound world. The result is convincing, but how are we to judge the visual manifestation against the purity of the original composition and sound? It’s a tricky business. Perhaps, then, a synthesis of image, gesture, and theater can extend our understanding and association with dissonance in music. For Dutch composer Michel van der Aa who appeared at the Phillips last week as part of the Leading European Composers series, the answer seems to be a resounding, yes. Van der Aa is quoted in a 2010 interview as saying, “You can’t say everything in music.” Clearly the composer who combines visual, musical, and theatrical worlds feels that a synthesis of artistic practices can say more than music can alone. Van der Aa was in town last Thursday with members of the New York-based International Contemporary Ensemble (ICE), who performed a range of his chamber works. The previous day he gave an intimate talk at the Center for the Study of Modern Art, revealing insights into his large-scale operatic works, One (2002), After Life (2005-06), Up-Close (2010), and The Book of Disquiet (2008). Next year in London, he premieres his latest work, The Sunken Garden, a collaboration with the English National Opera and other partners that employs 2D and 3D video, a first for live opera. So what of his chamber music? Well it isn’t chamber music in the traditional sense. In the solo piece Memo for violin and cassette recorder, violinist Erik Carlson recorded phrases of music into an old tape recorder, rewound it, and then accompanied his own, now historic performance. Van der Aa sees this dialogue between performer and recorded sound as a type of sonic split personality, the machine in this case assuming the theatrical alter ego of the violinist as a “second voice from within.” Indeed the cassette player is more than just a recording and playback device; it becomes a dominant force and character within the sound, enabling the performer to react but not fully control the performance. To regain control, he can stop, rewind, and play back, and the disjointing, mechanical punctuations of silence within the piece provide a jarring sense of tension. Van der Aa creates a similar sense of internal discussion in Rekindle, for flute and soundtrack, played by ICE’s Eric Lamb. The two “performers” borrow thematic material from each other, which they weave between parts in a musical conversation. In borrowing material from the flute, the soundtrack elongates its sounds, imitating them, creating new sounds the flute cannot replicate, and spreading them across a stereo field with increasing intensity. The flute is almost forced into virtuosic passages in a bid to fight back, to reclaim its position within the sound. Our only glimpse into Van der Aa’s combination of video and music was the program’s final piece , Transit, which employs film footage with a piano score played by the pianist Jacob Greenberg, and a soundtrack manned by Van der Aa on a mixing desk. The film depicts an old man stuck in a house that he can’t leave. The images are bleak, an almost Beckettian landscape of isolation, loneliness, paranoia, and fear. The character inhabits a type of limbo or stasis, between life and death where his actions, movements, and rituals seem impotent and devoid of meaning. The film depicts the man’s frailty and fight against age and the corresponding piano part echoes a mix of sad resignation and frenzied panic, with rapid flurries in the upper register giving way to fragments of longer arcing melodic sections. In one segment the piano seems almost harmonically stuck, stagnantly alternating between two notes as the character sits on his bed, gently swaying to and fro, as if trying to get up but not being able. The pianist sways also, imitating the action on screen, again displaying this dialogue between physical performer and recorded material. This piece is interesting in that it is an amalgam; the film footage was taken from a short film Van der Aa completed at the New York Film Academy, and the piano part is taken from Just Before, composed in 2000. Attesting to his ethos of synthesizing material and different media, Van der Aa attempts to create something new out of existing works with Transit, thinking perhaps together they can become greater than the sum of their parts. During the post-concert Coda Session, Director of Music Caroline Mousset showed the audience the score, which includes gestural indications and video stills, bespeaking the level of sophistication and control that Van der Aa seeks in his art. Asked whether he thinks his use of mixed media is an extension of the Wagnerian idea of Gesamtkunstwerk or “total artwork” and whether this approach to music is a natural progression for composers, Van der Aa was more circumspect, stating, “It’s not necessarily the future at all, but it’s my future.” If the originality, vision, and abundant possibility of Van der Aa’s artistic synthesis is anything to go by, it’s a future we are sure to hear lots about.